News 2018 Roanoke County Public Schools Student Registered Apprenticeship Program. 2018 Roanoke County Public Schools Student Registered Apprenticeship Program. 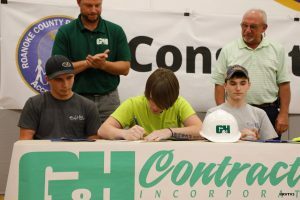 Congratulations to the Roanoke County Public Schools Students who participated in “Signing Day” for the Student Registered Apprenticeship program. G & H Contracting had six students sign with us for this program. Students in this program work toward credentials associated with each business through employment training and instruction.